Izzi Top emulated her dam Zee Zee Top nine years earlier by winning the Betfred Middleton Stakes at York. The 7-2 favourite was always travelling kindly in the hands of William Buick a couple of lengths behind the leader Mohedian Lady, who dictated affairs from the start until early in the straight. The John Gosden-trained filly picked up well but was challenged strongly by Sajjhaa and she had to be driven out to supplement her recent Newmarket victory by a length and a half. I'm A Dreamer stayed on to finish third after having had difficulty getting a run at a crucial stage of the race. Buick said: The horses have been running well all year. We've got a nice bunch of horses. I love this filly, she's top-class. She tries her hardest and what she really needs now is a Group One. She really deserves it (and) that would be the obvious next step up. "She jumps very well from the stalls and I could probably ride her from a bit further back, but they can't get away from her from the front. She was just looking around in front a bit, so today she was probably in front soon enough." Gosden said: "She's a really lovely filly. 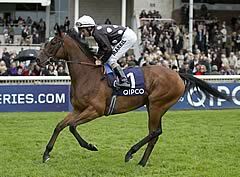 She won on this day last year, beating the Oaks winner (Dancing Rain) a head (in the Swettenham at Newbury). We obviously went on to finish third in the Oaks and I think she has improved quite a lot from three to four. "It was a good performance today and the obvious targets for her now are the Nassau Stakes and the Prix de l'Opera. There's nothing for her at Ascot unless we came back to a mile for the Windsor Forest and that probably wouldn't be the most sensible thing to do. "It's all about the second half of the season for her now and we'll try to find something along the way." Saeed bin Suroor said of the runner-up: "She will improve a lot for the run. I just hoped she could finish in the first three today and she has run a very good race. We'll consider the options for her now and there's a Group Three at Epsom or the Windsor Forest at Royal Ascot. She's a stronger filly this year and more relaxed."